The IMMA (Irish Museum of Modern Art), originally uploaded by infomatique. 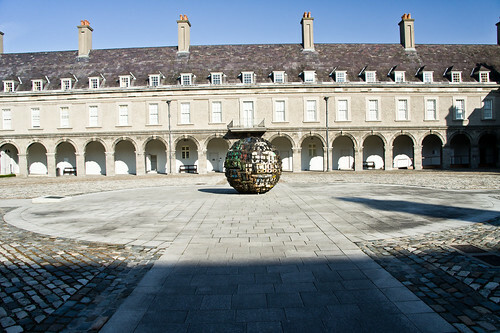 The IMMA (Irish Museum of Modern Art) is Ireland's leading national institution for the collection and presentation of modern and contemporary art. The Museum presents a wide variety of art in a dynamic programme of exhibitions, which regularly includes bodies of work from its own Collection and its award-winning Education and Community Department. It also creates more widespread access to art and artists through its Studio and National programmes. The Royal Hospital is a striking location for displaying modern art. Modelled on Les Invalides in Paris, it is arranged around a courtyard and the interior has long corridors running along series of modest interlocking rooms. The setting is very fine: the courtyard, the noble facades, a restored baroque formal garden and a lovely old dining room and chapel. The original stables of the Royal Hospital have been restored, extended and converted into artists' studios and the Museum runs an artist in residence programme. The Museum also has community and education programmes and a national programme whereby it exhibits works from its collection in other venues.